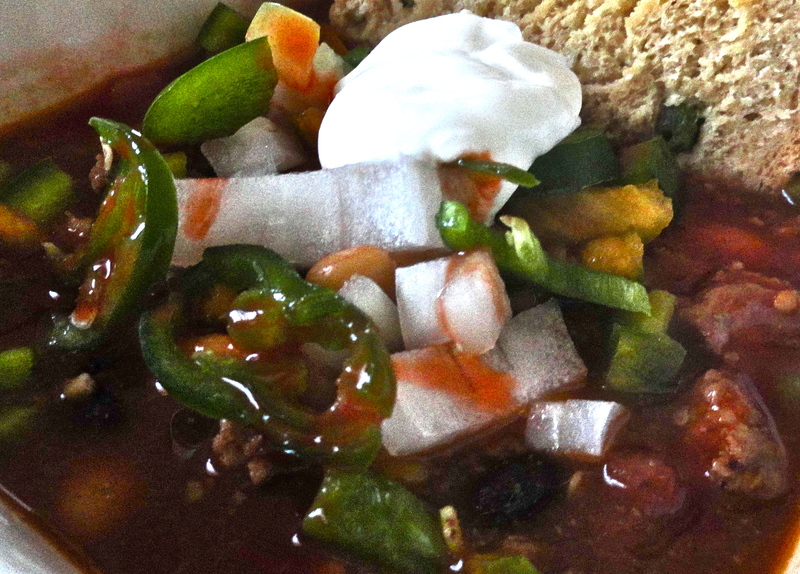 It is the perfect time of year for chili, and I had the perfect opportunity to make it this past weekend. We had just gotten back from visiting my best friend in Duluth, and our neighbors were coming over to watch the Vikings game (the 3-1 Vikings at the time!). 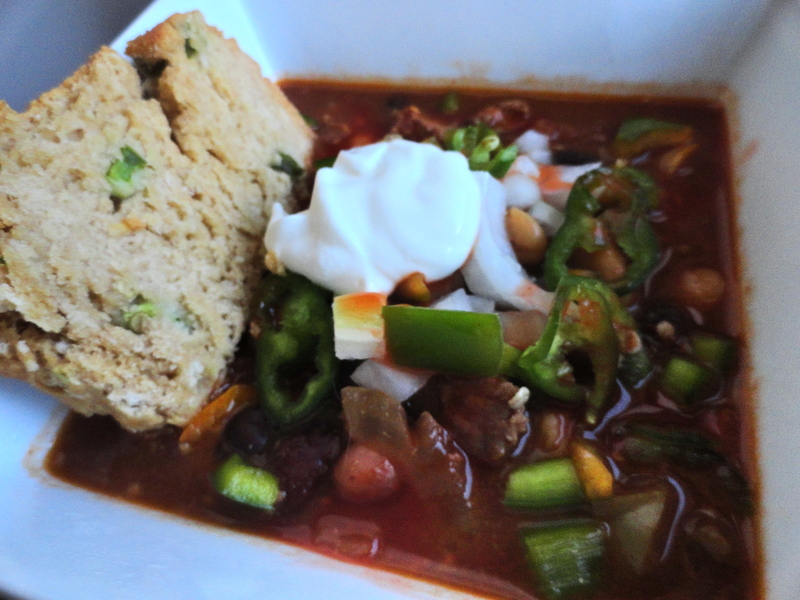 Everyone has their own recipe for chili, and many are probably like mine; it changes a little each time, but generally the ingredients stay the same. Growing up (and still), my dad always made a big pot of chili that would last my family for an entire week. This is where I first learned to make it myself. I pretty much stick to his recipe, with a few small changes. 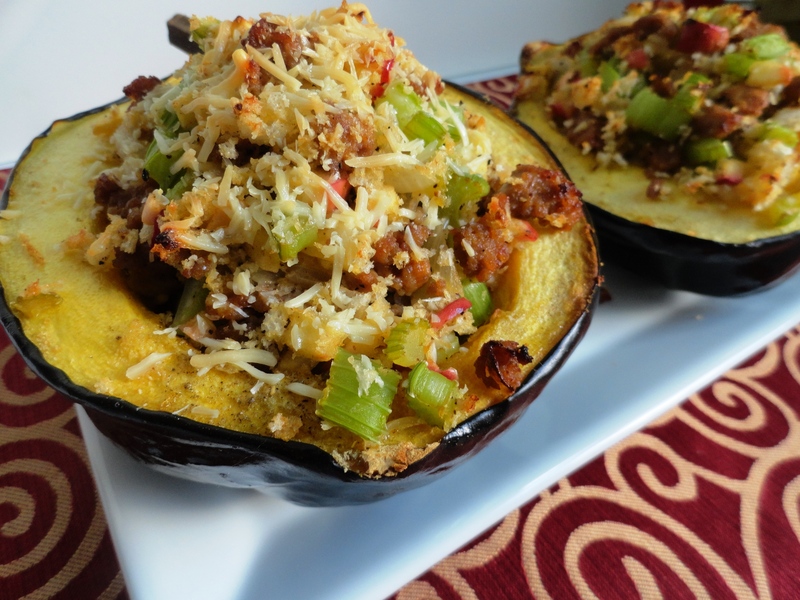 The awesome thing about chili is that it is so versatile. Not just with what ingredients you put in it, but how you eat it. Of course there’s the traditional way of in a bowl with some choice toppings, but you can also make chili fries, chili dogs/brats, chili burgers, baked potatoes topped with chili, nachos, chili tacos or taco salad, and so on and so forth. The possibilities are endless, so make a huge pot of chili and don’t be afraid to try it in a new vessel! If all else fails, chili freezes super well, so you can either put a large amount in gallon sized zip-top freezer bag, or individual servings in quart sized zip-top freezer baggies. 1. In a large skillet, heat olive oil over medium heat and brown meat. Add garlic for last 2 minutes of browning. Drain and transfer meat to large stock pot or slow cooker. 2. 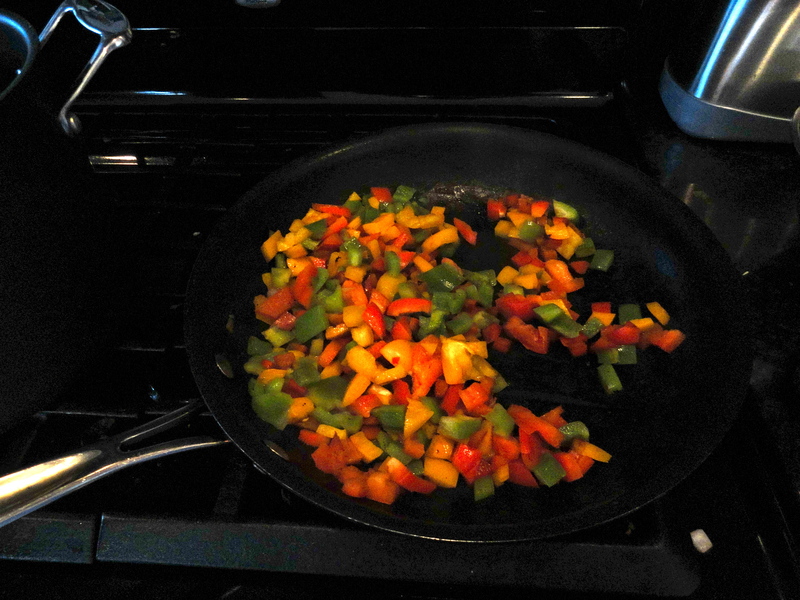 Using the same pan, add olive oil and saute peppers and onions over medium heat until slightly soft, about 3-5 minutes. You may have to work in batches depending on how large the skillet is. Transfer to stock pot or slow cooker with turkey. 3. Add all beans to stock pot or slow cooker with turkey and vegetables. Add tomatoes with all juices. Using a wooden spoon, break up whole tomatoes into smaller pieces. Add beer, cumin, chili powder and cinnamon. Salt and pepper to taste. If using stock pot over stove top, simmer mixture for at least one hour to let flavors develop and alcohol cook out of the beer. If using a slow cooker, cook on high for at least one hour, or low for 2-4 hours. 4. Stir in cilantro just before serving. Garnish with desired toppings (raw white or green onions, jalapenos, tomatoes, cheese, hot sauce, cilantro, tortilla chips, cheddar jalapeno beer bread, Greek yogurt/sour cream, corn bread…). I had an open can of pumpkin that I wanted to use up, but since my house was filled with desserts from the weekend, I didn’t want to make anything else sweet. I decided to go with Nicole’s sausage and pumpkin pasta. 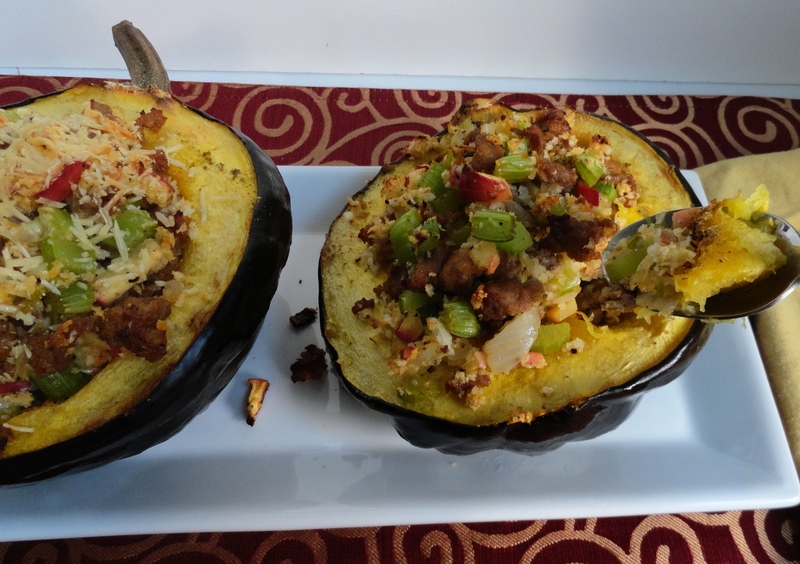 I know it sounds a little out there, and I thought so too, but I loved every other ingredient in this recipe, and I’m adventurous, so why not try it? I wasn’t so confident about Nate though, so I didn’t disclose what we were having for dinner until he was actually eating it. He saw the turkey sausages in the fridge thawing out, and asked if we were having brats for dinner. I said, “no”. Later, he again asked about the “brats” in the fridge. I told him it was none of his business, though I could sense he was really getting excited for “brats”. Finally, I had to break his little heart and tell him that the “brats” in the fridge were turkey sausages and were for dinner. To his credit, turkey sausages do look a lot like brats. The pasta was really great! I was surprised, and actually expected it to be a little more pumpkiny, but the sausage really was the star of the show. Perhaps this was because I like to buy the hot turkey sausages, but still, I thought the pumpkin would have been more prominent. Nate and I both had a second small serving it was so tasty. I think next time I would use just a little more sage, but beyond that, it was curiously delicious. 2. Spray a deep skillet with olive oil and heat over medium heat. Add sausage and onion and cook until sausage is almost cooked through. Add mushrooms and garlic. Cook for another 2-3 minutes. Drain juices if necessary. 3. Add chicken broth, wine, pumpkin, sage, salt and pepper. Bring to a boil, then reduce heat and simmer for 5-6 minutes. 4. 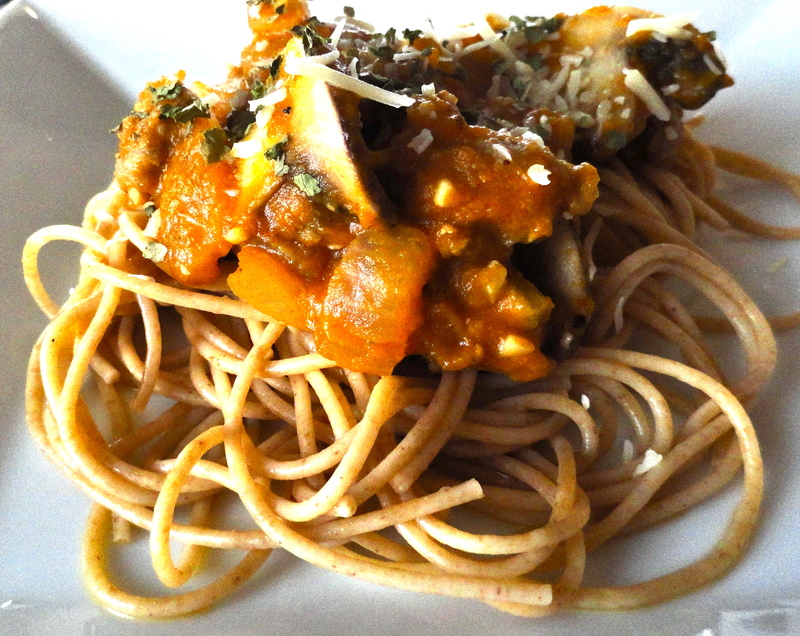 Spoon mixture over pasta, garnish with parmesan cheese and serve. 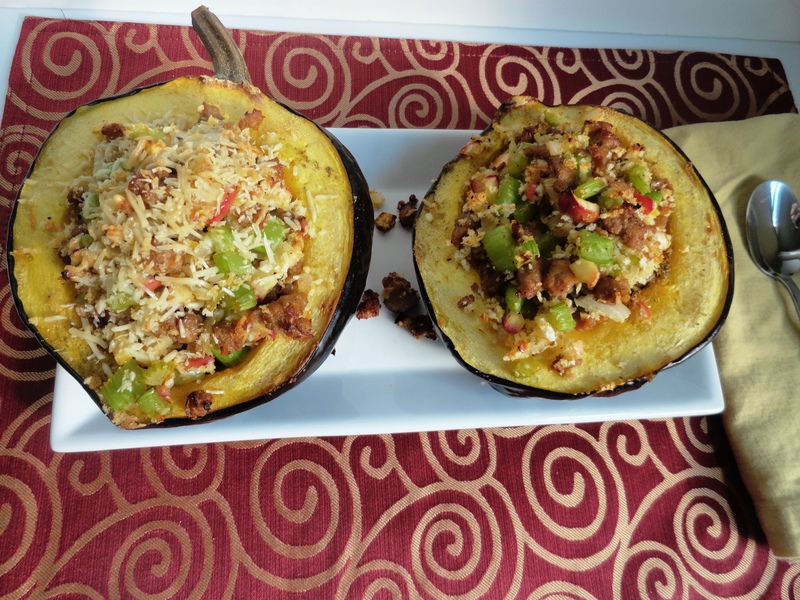 The theme of the most recent recipe swap was “Too Hot to Cook”, so all the recipes submitted were ideally no cook recipes, so at least no stove/oven, but grilling and slow cooker were allowed. I submitted my Chili Lime Shrimp Salad. 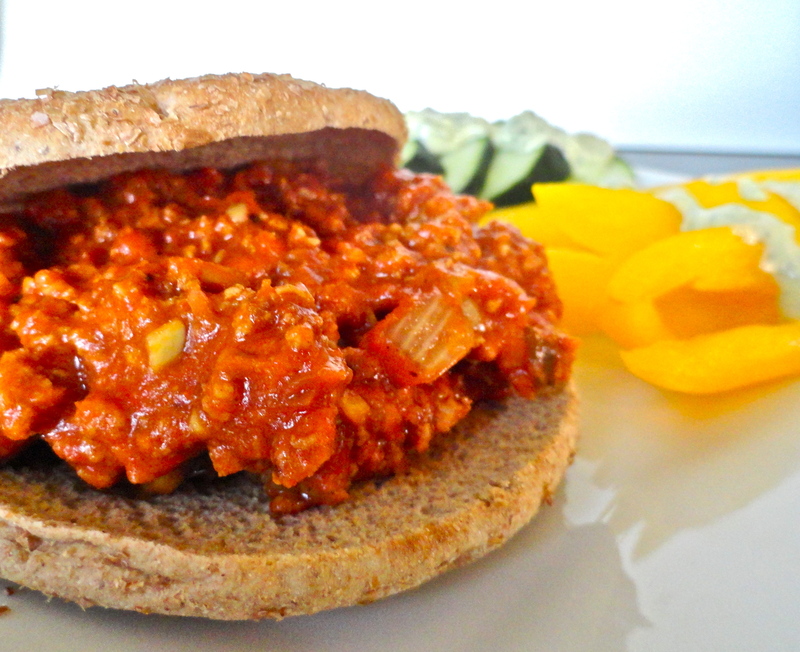 I received Tina’s blog, Tasty Treats by Tina, and she submitted sloppy joes. This was originally a swap recipe she’d received in the past, but altered to her own liking the second run, so I went off of her recipe. Anyway, I did the same thing with Tina’s recipe and substituted turkey meat for ground beef, and omitted tarragon, really just because I didn’t want to buy any just before leaving on vacation. I also adjusted the measurements for my own taste. After tasting it after it’d been in the slow cooker for a while, it was a little too tomatoy for my taste, so I did add more mustard to combat that. In the end, they were pretty tasty. Nate commented that they were a little too sweet, and I even lowered the amount of brown sugar it called for. Next time, I’d probably omit the sugar as I find it unnessicary. 1. In a large frying pan, brown turkey meat over medium heat. Drain and add to slow cooker. Add remaining ingredients, mix, and cook on low for 6-8 hours. *Since I only used 1 lb of turkey meat (vs. Tina’s 2 lb ground beef), I only cooked my sloppy joe’s on low for about 4 hours. 2. Serve on toasted bun. Pinwheels are so simple to make and a great snack to have on hand for the beach, the cabin, a picnic, or even as a fun appetizer. Of course you’ll need to keep them cool, but who doesn’t bring a cooler with them to these types of events? I made a batch of these and pesto chicken pinwheels to take to the beach with us instead of trying to make sandwiches for everyone, or trying to pack in a bunch of sandwich making ingredients so everyone could make their own. Once we opened them, they were not closed until we went home. They were a perfect little bite! 1. Lay out three wraps. Spread each wrap entirely with cream cheese, leaving only 1/4-inch around the edges. 2. 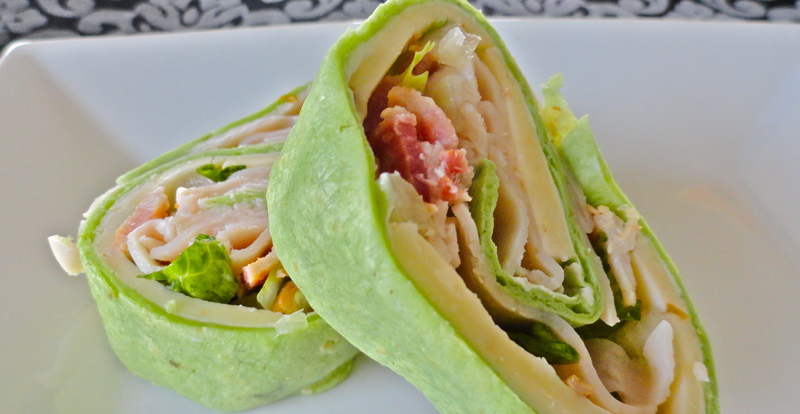 Layer the wraps with cheese, bacon, lettuce, onions, then turkey. 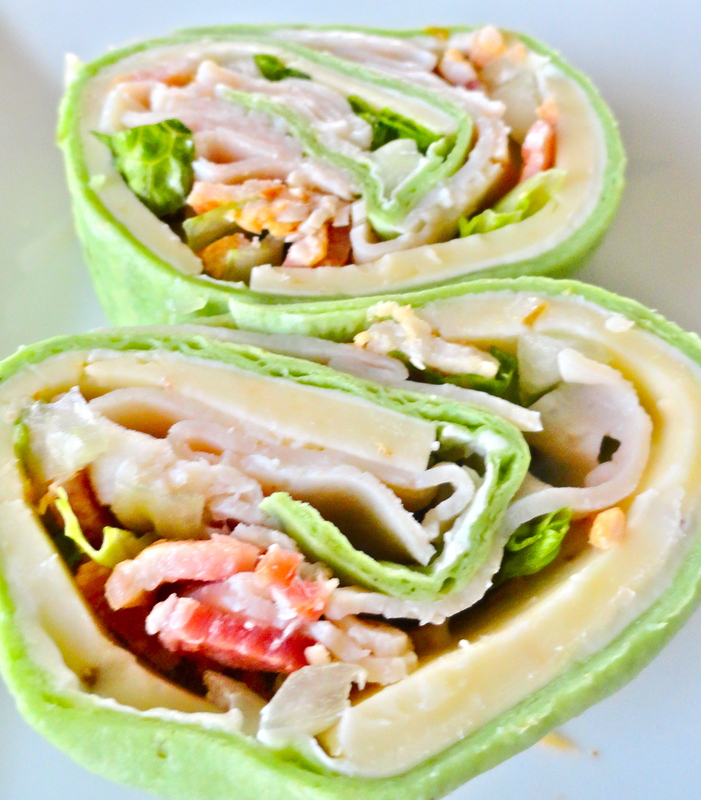 Be sure to evenly distribute all ingredients over entire wrap and do so thinly, so you can still roll it tight. 3. Tightly roll wraps, being cautious not to tear, and wrap in foil. Refrigerate for at least one hour before slicing. This will ensure the ingredients stick together rather than falling out the sides of your pinwheels. This is the first official recipe swap I’ve participated in, and I am so super excited. Even better is the fact that I got an awesome recipe to make that is directly up Nate and my’s flavor lane. 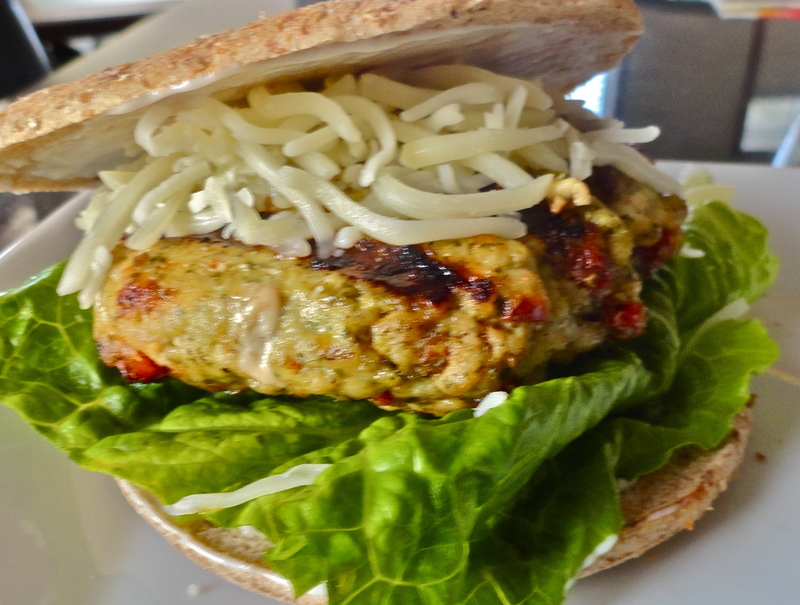 The swap was a burger/sandwich recipe swap, and I submitted my cream cheese and jalapeno stuffed turkey burgers. I was confident that this was the best burger I’ve made. 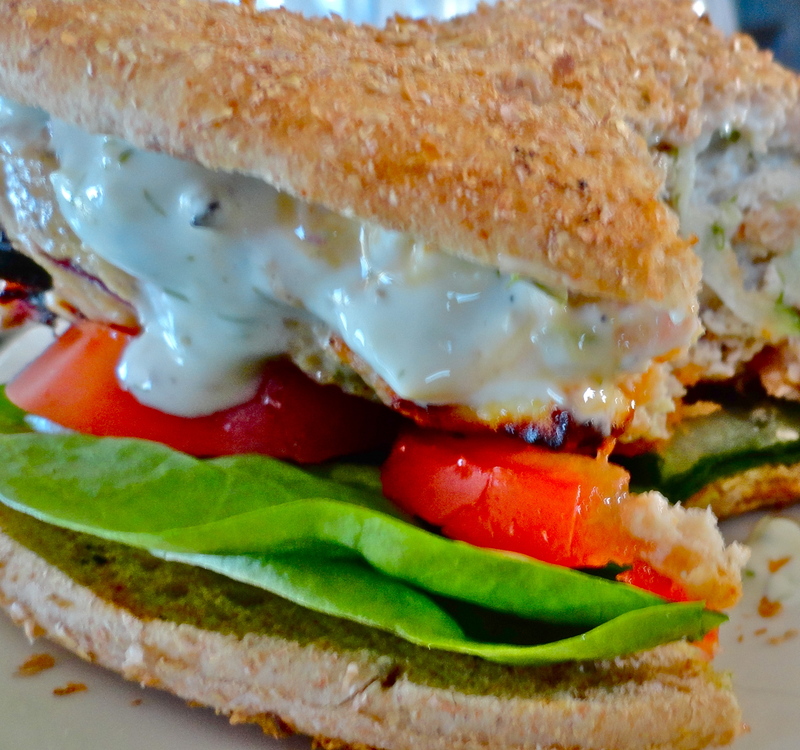 That is until I made Kate’s Greek turkey burgers. 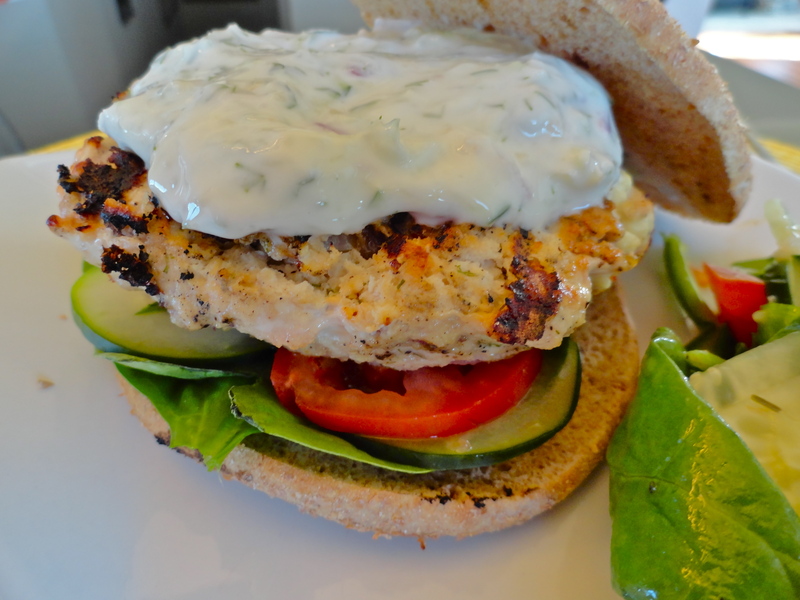 Not only do Nate and I love turkey burgers, but we love Greek flavors, too! I couldn’t have been more stoked to make this burger, plus I already had every.single.ingredient on hand. Also, I made it the Monday following the Friday I received the recipe. Friday was date night, Saturday my bestie had us over for grilling, and Sunday we went out for Father’s Day. So, this was quite literally the first opportunity I had to make this burger, and I’m sure glad I did. Of course I made my burger sans feta, but Nate’s was packed with it. He must not have had any in his first few bites, but once he bit into the feta, he said, “wow!” (in a good way, of course). 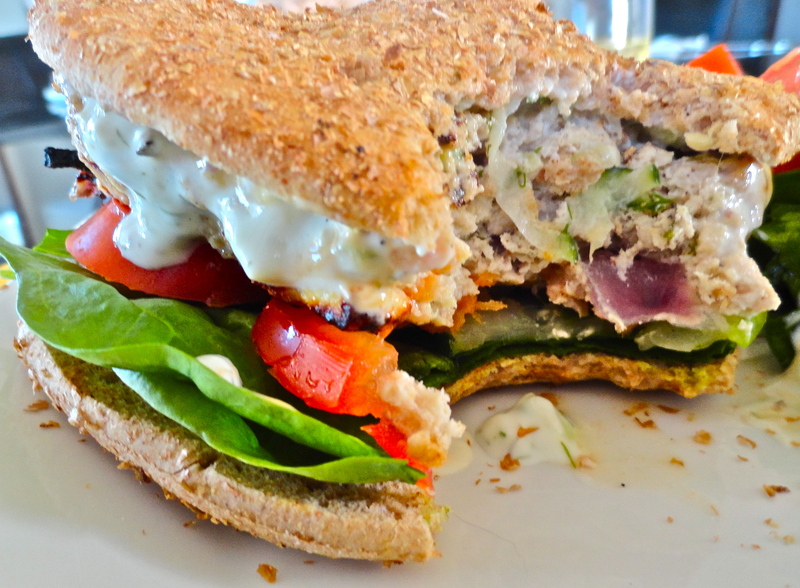 This tzatziki recipe was much better than the one I used previously, so if you make it, go with this one. I think it’s the shredded cucumbers, rather than just dicing them. Love. 1. In a small bowl, mix tzatziki ingredients together. Refrigerate until burgers are ready to serve. 2. Heat grill to medium heat. In a large bowl, mix turkey, feta, onion, dill, garlic, salt and pepper lightly until just combined. Separate mixture into quadrants and make into 4 patties, about 1/2-inch thick. Cook patties over medium heat until cooked through, about 8-10 minutes on each side. 3. 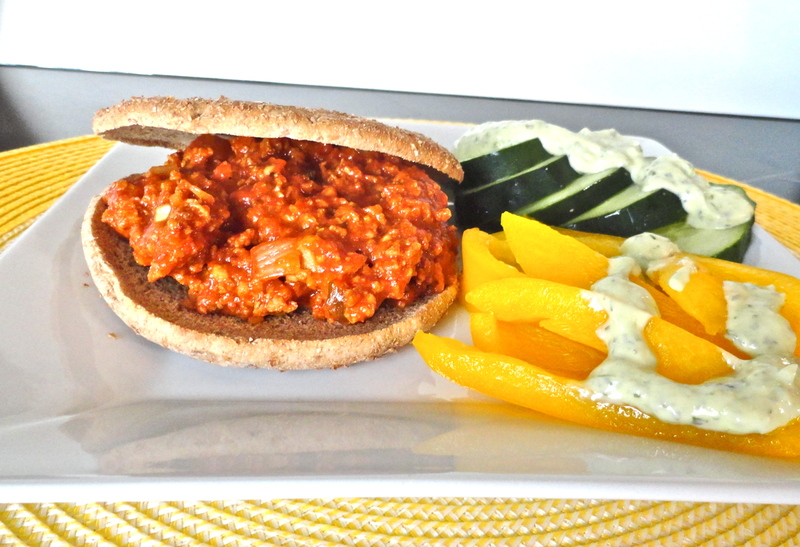 Serve patties on bun, pita, or sandwich thin (this is what I used). Garnish with spinach leaves, cucumbers, and tomatoes. Top with tzatziki sauce and serve.